I just finished The Field Guide to the North American Teenager yesterday and I adored it. I finished it in one day because Norris is a character who spoke to me. I flat out adored this book. From page one I knew I wouldn’t go to bed until I finished reading it because Norris is spectacular. He’s a character I instantly loved. Transplanted from snowy Canada into the depths of warmth in Austin, Texas, Norris hates just about everything. And I feel like Norris spoke to me. He spoke to me in the ways he mouths off to bullies, his quick intellect, and the way he hides his pain. Not only that, but this book has real depth. It’s not just a book about his mistakes, and how he sees beyond his snap judgements. Norris encounters casual racism and the dangers of his actions as a black man. So some people are going to find Norris unlikeable. And he is. He’s one of those people who won’t let people get close to him, who uses sarcasm as a defense mechanism, and keeps basically everything close to his chest. But he’s also incredibly relatable because he is so deeply unhappy. He feels so much like an Outsider ever since his feet touch American soil and he is counting down the days until he can return to Canada. Even though you think, “Well Norris isn’t really trying to be nice to people”, you also think, this is a teen who is in defense mode. It also doesn’t help that Norris makes snap judgements about people and he doesn’t try to see them beyond their labels. This is almost like a Mean Girls meets Norris. But what Philippe does in The Field Guide to the North American Teenager is he makes Norris relatable to us in a way that none of these films or tropes, ever do. The ways the divorce of his parents still hurts him to this day, or the fact that his best friend moving on without him makes him feel not needed, or that being okay with being alone, doesn’t mean you aren’t lonely. And what I loved is that The Field Guide to the North American Teenager kind of takes elements we’ve seen before, the notebook of thoughts, mean sarcastic outsiders, and manic pixi dream girl elements, and combines them in unseen combinations. It heightens and develops our concept of these stereotypes, forcing us, as readers, to do exactly what Norris struggles with. And it consistently doesn’t allow us to take short cuts. Not to mention, some of the most emotional scenes come at the ending. When we are confronted with our own mistakes. And the dangers of being a black man. Philippe wants this book to help showcase the variety of people black men are outside of their type casting, stereotypes, and monolith. A black teen who doesn’t necessarily see his blackness, but who can’t escape the ways it effects his realities – just another self-obsessed teenager. The side characters are nuanced and I almost want books about every single one of them – Liam and Maddie and Aarti! Even though labels have made the world fit into artificially constructed boxes, everyone in this book has hidden depth. They surprise you even till the very end. And Philippe, even at the end, doesn’t allow us to relax into what we think will happen – instead delivering us an ending that is going to be more satisfying and surprising than we ever thought. 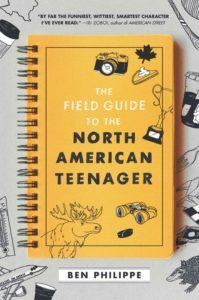 Find The Field Guide to the North American Teenager on Goodreads, Amazon, Indiebound, & The Book Depository. Who is your favorite super hero? I never grew up loving super heroes, only really after college did I become obsessed with all of the Marvel movies. If I had to pick a favorite? Maybe Loki, even though it’s like, is he a hero? To me he is! I’m not really into superheroes so I don’t have any faves xD I’ve been looking forward to this book ever since one of my favourite booktubers mentioned it. I’ve never read a French Canadian character, especially a Black one, so that’s also cool. it is super cool and unique! I hope you like it!